Manual entry can be done be players or by score takers, but using score takers greatly reduces the chance of errors. We have two different scoresheets for doing manual entry. It's important to remember that when there are pools of different sizes you need to consider the win % rather than just the number of wins. With this version, the focus is on point differential. Following the game order, teams put their point differential (ex: +5 or -5) for each round of the sheet. At the end, the wins and point differential are totaled. These scores will then be entered and seeds calculated using this file. Having dedicated score takers for specific pools is a very efficient way to collect scores. 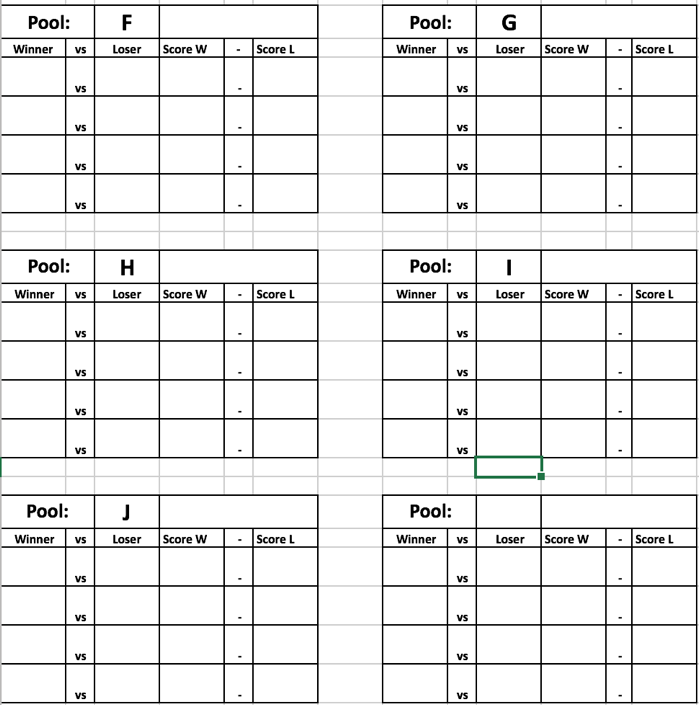 Each sheet should include all the pools that one score taker is responsible for with space to fill out winner, loser, winning score, losing score. Number needed will depend on size of pool, but it’s good to print a bunch of extras. Clip all the score taking sheets associated with the group of pools to clipboards. Winners will give score takers the pool and seed of their team and the pool and seed of the losing team followed by the score. Once a score sheet starts to fill up, hand it off to the people responsible for entering and calculating scores. Note, if you are using our Spikeball Spreadsheet it doesn’t matter if you’ve gotten all the scores from a specific round. You can pass off the scoresheet at any point. Teams have to walk less to report scores. Score takers don’t need to write down the same scores in multiple locations. Score takers don’t need to worry about what round of play a match happened in. Score takers can pass information to the people entering the scores at any point.